I was picking up crumpled papers in the living room when I found this interesting pieces beneath the sofa. I browsed through the innocent-looking papers to make sure they are not important documents. 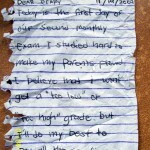 They were torn pages from my son’s diary who was 10 at the time. Today is the first day of our second monthly exam. I studied hard to make my parents proud. I believe that I won’t get a “too low” or “too high” grade but I’ll do my best to pay all the sacrifices and to give thanks for all of their hardwork. 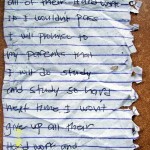 If I wouldn’t pass, I will promise to my parents that I will do study and study so hard next time. I won’t give up all their hard work and sacrifices. This entry was posted in Kids and tagged kids lesson, kids sermon, lessons from kids, things we learn from kids on August 23, 2011 by Yami.